Louisiana, a southern state bordering on the Gulf of Mexico. It has a total area of 51,885 square miles (135,382 km²) and in 2008 had an estimated population of 4,410,796. 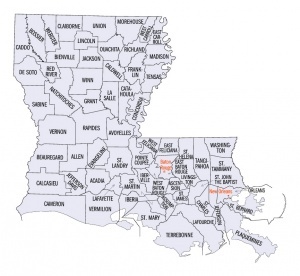 In 2005, 64.77% of Louisiana's population was White and 33.47% was African American. It is probable that the first Mennonites to visit this state were immigrants from Alsace-Lorraine, who landed at New Orleans, a seaport and the chief city of the state. Thus in 1839 Christian Reeser and his two brothers and sister from France arrived in that city. In 1874 John F. Funk had correspondence with Mennonites who were residents of New Orleans (Mennonite History Bulletin, July 1954). In 2000 the two Church of God in Christ, Mennonite congregations had 380 members and the four Mennonite Church USA congregations had 216 members. The Association of Religion Data Archives (ARDA). "State Membership Report: Louisiana, Denominational Groups, 2000." http://www.thearda.com/mapsReports/reports/state/22_2000.asp (accessed 23 February 2009). Gospel Herald (9 August 1988): 537-539. Hertzler, Daniel. From Germantown to Steinbach. Scottdale, PA, Herald Press, 1981: 65-75. Mennonite Church Yearbook (1988-89): 26, 58, 151. Gingerich, Melvin and Reynold Sawatzky. 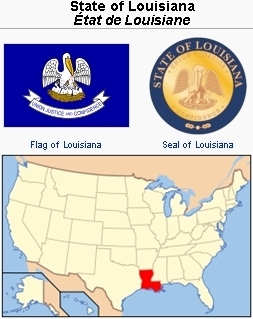 "Louisiana (USA)." Global Anabaptist Mennonite Encyclopedia Online. February 2009. Web. 20 Apr 2019. http://gameo.org/index.php?title=Louisiana_(USA)&oldid=114441. Gingerich, Melvin and Reynold Sawatzky. (February 2009). Louisiana (USA). Global Anabaptist Mennonite Encyclopedia Online. Retrieved 20 April 2019, from http://gameo.org/index.php?title=Louisiana_(USA)&oldid=114441. Adapted by permission of Herald Press, Harrisonburg, Virginia, from Mennonite Encyclopedia, Vol. 3, p. 403; vol. 5, p. 530. All rights reserved. This page was last modified on 28 February 2014, at 08:33.